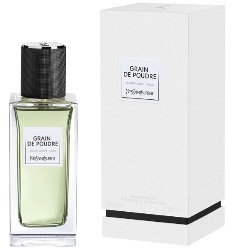 Yves Saint Laurent will launch Grain de Poudre, a new fragrance in the Vestiaire des Parfums series. Grain de Poudre refers both to the tightly woven wool fabric used in many of the designer's tuxedo jackets, and also to a textured leather finish. A new iconic garment to complete the olfactive wardrobe of Le Vestiaire Des Parfums. With notes of violet accord and sage. Resembling the iconic Grain de Poudre fabric featured in Yves Saint Laurent blazers and handbags, Grain de Poudre is the latest addition to the Le Vestiaire collection. A spicy leather scent that blends black peppercorn and coriander with violet leaves and sage, rounded out with suede accord and musk. Yves Saint Laurent Grain de Poudre can be pre-ordered now at Neiman Marcus, $250 for 125 ml Eau de Parfum. Who preorders a new unsmelled perfume I wonder. I have done it, but not often, and certainly not an YSL.